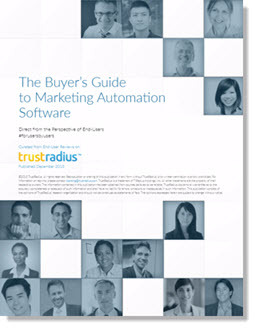 Research company TrustRadius just published their new edition of the “Buyer’s Guide to Marketing Automation Software,” and it’s a doozy. Let’s face it, most martech “guides” are written by, well, marketers, and are either sponsored by or authored by the technology vendors themselves, so the content needs to be read with a critical eye. As an independent research company, TrustRadius bases their content on in-depth user reviews and takes pains to maintain both credibility and transparency in the way they rate, score, and evaluate business technology. At a whopping 107 pages, their new marketing automation guide provides what I think is one of the most useful and comprehensive reports to date on this fast-moving category. You can download a free copy (registration required) from the TrustRadius Website. Whether you’re a marketing automation newbie or a hardened veteran, the guide offers useful information and insightful reading. For those planning the leap into marketing automation (or perhaps just contemplating a platform switch), this might just be the only guide you need. This entry was posted in Marketing Automation and tagged hubspot, market research, Marketing Automation, marketing automation agency, marketing automation buyer's guide, marketing automation consultant, marketing automation consultants, marketing technology, marketo, martech, pardot, trustradius on December 16, 2015 by Howard Sewell.